The Vegan Magpie: Vegan Town Veganuary offer! Hello! Delicious treats sellers Vegan Town are offering a lovely 10% off all orders for Veganuary! Just head here: Vegan Town and use the code 'VEGANUARY' at the checkout. 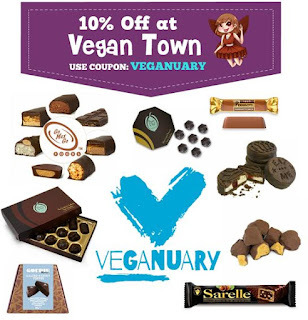 Vegan Town offer a wide range of tasty products including a massive range of vegan chocolate from a variety of countries, as well as lots of sweets and biscuits! This discount also works on their chocolate treats box (however it appears to take 20% off before VAT is added, so bear this in mind). There is delivery to consider, which starts at £3.95, or is free on orders over £45. This may be a good way to try some hard to get chocolates, or have a little taster of everything if you've only recently become vegan!